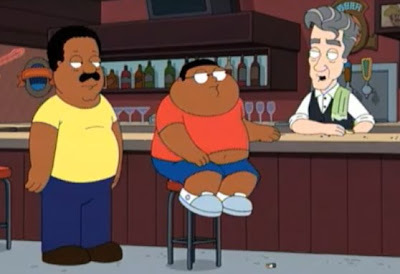 So the bartender character on tonight’s Cleveland Show that looked like David Lynch and sounded like David Lynch was, in fact, voiced by David Lynch. I wouldn’t have continued watching had I not been so convinced it really was him doing the voice. And it was — though I can’t imagine why he would. The role wasn’t particularly bizarre or funny or Lynch-y in any way. Given that he wasn’t playing himself and didn’t have any reason to be on the show, I’d say his guest role was actually weirder than Thomas Pynchon’s on The Simpsons, which, by the way, happened twice. Also, the same episode had Kristen Wiig also do a voice. This is less weird because Wiig is primarily a comic actress who normally appears on TV. However, the episode gave her nothing to do. The role just wasn’t particularly funny. So weirdness again. Why hire a funny person like Wiig to be the boring person on a sitcom? Isn’t that like hiring a supermodel to appear in a movie and then dressing her in an ugly monster costume the whole time? Couldn’t they have hired someone much cheaper for such an unremarkable role? EDIT: Apparently Lynch was asked to do the role because his film Wild at Heart inspired Mike Henry — creator, showrunner and voice of the title character — to get into writing and comedy to begin with.